Dubai: Qantas believes the revenue-sharing agreement it signed with Emirates last year is playing a key role in strengthening its position on the European route despite international losses almost tripling. The Qantas Group released its half-year results on Thursday, announcing a before tax loss of 252 million Australian dollars. Its international division reported an EBIT (earnings before interest and tax) loss of A$262 million, compared to A$91 million in the first half of 2013. The Australian financial year runs from July 1 to June 30. Qantas and Emirates launched the partnership in March 2013, which saw Qantas end its 17-year revenue-sharing partnership with British Airways. Qantas moved its London-bound Southeast Asia hub to Dubai as part of the deal. He added that the cost in moving the hub is unlikely to be a significantly contributor to the losses. A Qantas spokesperson later said in an email that “we absolutely stand by the Emirates partnership as the right decision.” Citing “competitive reasons,” Qantas would not disclose details on the performance of the partnership. Webber said that the international losses are surprising despite overall results coming in better than what most analysts had expected. “[The international losses] would really be hurting the company because they said 12 to 18 months ago they are set on turning that part of the business around and had made inroads,” he said. John Strickland, Director at JLS Consulting, stated that working with Emirates is now even more strategically important in the context of the financial results. Earlier this year, Emirates President Tim Clark said the airline is not interested in taking an equity stake in Qantas. On Thursday, Gulf News asked Emirates if it is still confident that the partnership is the right decision and whether it would reconsider its stance on an equity purchase. Emirates did not respond by the deadline. Qantas will now cut as many as 5,000 jobs and defer or sell the purchase of more than 50 aircraft in a bid to shave A$2 billion in costs. This includes deferring Qantas International’s eight remaining Airbus A380s. It has 12 in its fleet. It will also defer the final three of 14 Boeing 787-8s its wholly owned subsidiary Jetsar has on firm order. Webber said the move to defer or sell aircraft is the right decision. 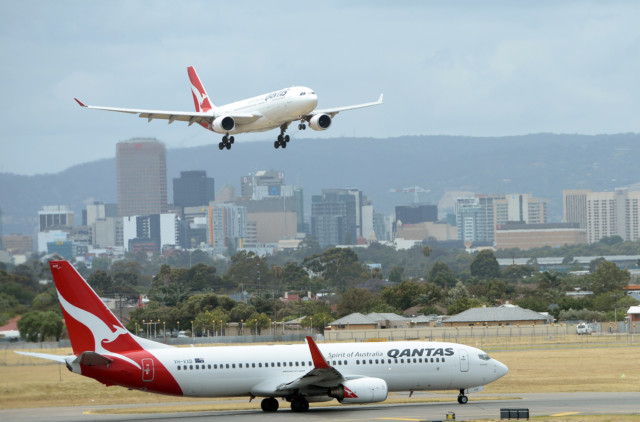 But Strickland said there is certainly a political message to the Australian government with respect to ownership and investment issues, which in Qantas’s eyes limit their financial flexibility. In the lead up to Thursday’s financial results, Joyce strongly criticised rival Virgin Australia’s foreign ownership structure. Singapore Airlines, Air New Zealand and Etihad Airways each own significant minority stakes in Virgin Australia. Joyce has blasted the “unfair playing field” he says he is forced to play on because Australian federal legislation restricts foreign investment in Qantas.